In the context of Ayurveda, inner and outer beauties are intimately related. The more we nurture ourselves, the more radiant we become physically and expressively- regardless of our particular body shape or proportions. 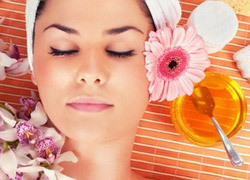 Ayurveda understands beauty as being a product of general physical health and appropriate daily care. The emphasis is onself-knowledge and development of positive routines and habits that will bring out the best in each one. An Ayurvedic facial massage activates deep centres of the brain, reflex points and facial circulation to totally soothe the body. Tensions in the neck, shoulders and face are freed and energy is rebalanced from head to toe. Herbal extracts and essential oils may be added for their additional healing properties and pleasant fragrances.